If nothing else, Week 15 in the National Football League has taught me that this is definitely the year of the quarterback. Despite the fact that Aaron Rodgers actually looked human in a shocking loss to the last-place Kansas City Chiefs at Arrowhead Stadium, one still can't ignore the amazing overall season he's had to this point. Then there's Drew Brees and Tom Brady, who both thrust themselves right into the MVP race with brilliant performances in blowout wins on the road over the Minnesota Vikings and Denver Broncos respectively. At least one, if not all three of these guys is going to break Dan Marino's single-season record for yards passing, which currently stands at 5,084. It's not the first time that Brees and Brady have flirted with that magic number either. Bress came up just 15 yards short back in 2008, while Brady finished 278 yards shy of the mark during his 2007 MVP season. Many have speculated that offensive numbers are up this year due to the shortened training camp caused by the strike. However, I don't believe in the case of these players, it would have mattered one way or another. These three are playing at a level the likes of which the NFL has rarely seen, and in the same season no less. On any given Sunday, an argument can be made for any one of the three to be the best in the league, and it would be hard to argue otherwise. That is, of course, unless you're arguing for one of the other two. Seriously, how many times in league history have three guys been playing at such a high level simultaneously? None that I recall. All three are going to throw for over 5,000 yards. All three are going to have a quarterback rating well over 100. Furthermore, all three are going to have their teams right in the thick of the Super Bowl hunt once the playoffs get underway. Coincidence? I think not. If the NFL has taught me anything over the years, it's that everything you think you know, is probably wrong. The Packers looked unbeatable. The Colts looked incapable of winning. Tim Tebow looked incapable of losing. All those things turned out to be false, and they were all disproved in about a six-hour span. Still, I think it's a pretty safe bet that at the end of Super Bowl XLVI, either Brees, Brady, or Rodgers will be standing on a podium hoisting up the Lombardi Trophy. Now, the only question is, which one will it be? I would say Rodgers is still the front runner for MVP, but losing to the Chiefs didn't exactly help his cause. I still think the Packers are the team to beat, but I wouldn't be shocked if either the Saints or Patriots win it the way Brees and Brady are playing. I think it's going to 100 percent be based on matchups. I'm a Patriots fan, but I have a feeling if we have to play the Ravens, oh boy. The Ravens are the classic team full of guys who only try when it counts. And when the Ravens try, well you saw what happened 2 years ago to the Pats. I'm not saying New England can't make it to the Superbowl, but I would sure like to avoid the Ravens if possible. Give me some TJ Yates all day. On the NFC side, I think the Saints have to be the front runner. They are going into the playoffs like Green Bay did last year, on fire. The Packers are going to be limping in. I wouldn't count out the Cowboys though, they have too much talent and can beat anybody in the NFC. My picks for the Superbowl though are Saints vs. Patriots and the Saints win. I don't think the pats d can contain that offense in the dome in Indianapolis. 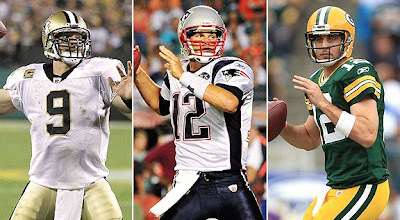 Drew Brees will be the superbowl MVP and may be the regular season MVP if Rodgers sits the final game. Dude, a week ago I would have said the Packers are the clearcut favorite, but after losing to the Chiefs, I'm starting to think it's the Saints now. They're playing their best football at the right time. Brees should definitely be in the MVP running now. He's having a monster season. While I wouldn't say Green Bay's loss to Kansas City is reason to panic, it is cause for concern. Rodgers has looked average at best two of the last three weeks, While Brees and Brady appear to be getting stronger as the season moves forward. The only reason I would still put Green Bay in the drivers seat as far as the NFC playoffs go is because they'll be playing at home throughout. New Orleans isn't the same team outside as they are indoors. I wouldn't have a problem with any of these three being named MVP though. All three deserve it really. Don't forget about QB's that we never expected to be good this season, guys like Alex Smith. The NFL is a QB driven league, and without a competent starter, a team isn't going to win games. My money is still on Aaron Rodgers for MVP. The Packers going down was just a speed bump. They are still the best team in the league and Aaron Rodgers is still the league's best quarterback. They are going to repeat. The Saints look like a big threat to the Packers moving forward. I also think that Brees or Brady could still overtake Rodgers for MVP. The last two games are going to decide it. I think it's a dead heat coming down the home stretch as far as MVP goes. Rodgers has tailed off some, while Brees and Brady continue to be at the top of their game. I think the Packers are still the team to beat, but I wouldn't be shocked if they go down.